The six string single strung classical guitar came to Argentina early in the nineteenth century. The Italian guitarist Esteban Massini (1778-1838), arrived to Argentina in 1822. Eight years later the poet Esteban Echeverria returned from his European studies, bringing with him the teachings of Sor and Aguado. Many others followed, including such pivotal figures as Gaspar Sagreras (1838-1901) in 1860, Carlos Garcia Tolsa (1858-1905) in 1885, and Antonio Jimenez Manjon (1866-1919) in 1893. Consequently, native guitarists also began to flourish, prominently among them, Juan Alais (1844-1914). Finally, of the disciples of Francisco Tarrega, the father of the modern classical guitar, arrived. Miguel Llobet (in 1910), Emilio Pujol, and Josefina Robledo came for extended periods to perform and teach. Others settled permanently in Buenos Aires, including Domingo Prats (first visit in 1908), and Hilarion Leloup (1876-1939) in 1912, establishing schools and academies that at their height provided instruction to over five thousand students, laying the foundation for an immense flowering of young virtuosi. The rise of the classical guitar in Uruguay ran a parallel course. Antonio Saenz, from Seville, set out his teaching shingle in 1829. A number of guitarists came in exile from Buenos Aires to escape the dictatorship of Juan Manuel de Rosas, and others ventured to Argentina to study with Massini. Of course, Tarrega's disciples came too to perform, and others, such as Conrado Koch, settled as teachers. The consequences for Montevideo were in close alignment with those for Buenos Aires - the development of a solid core of brilliant young performers, from Isaias Savio and Julio Martinez Oyanguren to Abel Carlevaro. 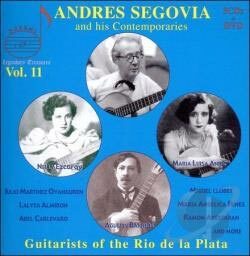 It was no wonder that Andres Segovia, seeking sanctuary from the vicissitudes of the European scene, came to live in Montevideo in 1937. By the time Munoz published his Historia in 1930, the Rio de la Plata had become the central axis for classical guitar activity. Journals were devoted to the guitar, notably Juan Carlos Anido's La Guitarra in 1923 and the Revista Musical Ilustrada Tarrega in 1924. The publisher Francisco Nunez's Antigua Casa Nunez 1931 Nuevo Catalogo de Metodos y Obras Musicales ran to108 pages! Besides the imported Spanish guitars of Torres and his school, including Enrique Garcia and Francisco Simplicio, native builders, such as Rudolfo Camacho Viera (1887-1973), constructed impressive instruments. The Rio de la Plata continues to be a fountainhead for the classical guitar. A glance at today's leading performers and composers - Jorge Morel, Eduardo Fernandez, Jorge Cardoso, Cacho Tirao, Alvaro Pierri, to name but a few-reflects its continuing preeminence. In this golden age of the guitar, recording activity was remarkably intense, and from the wealth of recordings available, a judicious selection had to be made. The artists have been divided into three groups-classical, folkloric, and popular. The divisions are not absolute, though, since their repertoires were remarkably fluid. There is no contradiction in observing the great classical guitarist Maria Luisa Anido playing a triste or a gato along with Rameau and Rodrigo, or Julio Martinez Oyanguren, noted for his interpretations of the purely classical repertoire, assaying a pericon, an estilo, or a vidalita. The tango virtuoso Jose Maria Aguilar performed works from the classical repertoire, and the folkloric guitarist Abel Fleury was equally renowned as a classical guitarist.